1 In analytic geometry, one of the four regions of the plane determined by two lines, the x-axis and the y-axis. Commonly these lines are drawn perpendicular to each other, and the quadrants, or regions, they determine are numbered counterclockwise, beginning with the upper right quadrant. 2 In geometry, a region of a plane determined by two perpendicular radii of a circle and the circle itself. Thus two perpendicular diameters of a circle divide it into four regions, or quadrants. instrument for measuring the altitude of the sun or another celestial body; such measurements can then be used to determine the observer's geographical position or for other navigational, surveying, or astronomical applications. ..... Click the link for more information. , a similar instrument based on a scale of 60°. The quadrant is rarely used today. (kwod -rănt) An instrument dating back to antiquity and used for measuring altitudes and angular separations of stars. It remained the most important astronomical instrument until the telescope was invented. It consisted of a 90° graduated arc (a quarter circle) with a swiveling arm to which a sighting mechanism was attached. In the mural quadrant the graduated arc, often very large, was attached to a wall and was orientated along the observer's meridian. The mural quadrant was therefore the forerunner of the transit circle. Arc of a circle, forming one-quarter of its circumference. The quadrants of a horoscope refer to four sets of three houses: Houses one, two, and three (first quadrant), houses four, five, and six (second quadrant), houses seven, eight, and nine (third quadrant), and houses ten, eleven, and twelve (fourth quadrant). A quadrant is also an instrument used to calculate the position of celestial bodies. In Europe, quadrants superseded the use of astrolabes during the Renaissance. in astronomy, an astronomical angle-measuring instrument that was used to measure the altitudes of celestial bodies above the horizon and the angular separations between bodies. A quadrant consisted of a quarter-circle, whose arc was divided into degrees and fractions of a degree, usually mounted in a vertical plane. A straightedge with diopters or a viewing tube usually rotated around the axis passing through the center of the circle and situated perpendicularly to its plane. Large mural quadrants were used in the past at astronomical observatories; these were fixed to stone walls of the building. Quadrants cease to be used at the end of the 17th century. One of the four regions into which the abdomen may be divided for purposes of physical diagnosis. An instrument for measuring altitudes, used, for example, in astronomy, surveying, and gunnery; employs a sight that can be moved through a graduated 90° arc. A lever that can move through a 90° arc. A quarter of a circle; either an arc of 90° or the area bounded by such an arc and the two radii. Any of the four regions into which the plane is divided by a pair of coordinate axes. A device for converting horizontal reciprocating motion to vertical reciprocating motion. One of the four areas between consecutive equisignal zones of a four course radio range station. A casting, forging, or built-up frame in the shape of a sector of a circle attached to the rudder stock and through which the steering gear leads turn the rudder. A double-reflecting instrument for measuring angles, used primarily for measuring altitudes of celestial bodies; the instrument was replaced by the sextant. A sector of one-fourth of the field of vision of one or both eyes. 1. An angle-measuring instrument used for measuring elevations. 3. A device for fastening together the upper and lower leaves of a Dutch door. i. A quarter portion of a circle, centered on a NAVAID (navigational aid), oriented clock-wise from magnetic north. The divisions of the circle are as follows: NE quadrant from 000° to 089°, SE quadrant from 090° to 179°, SW quadrant from 180° to 269°, and NW quadrant from 270° to 359°. ii. The housing in an aircraft cockpit on which the engine control lever (throttle) is mounted. 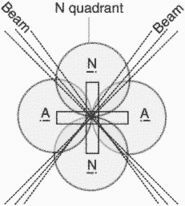 The top of the quadrant is shaped like a quartercircle and, hence, the name. iii. An instrument similar to a sextant but constructed with its arc graduated in degrees for a fourth of a circle. Often called a sextant. iv. The fourth part of something, as a quadrant in a radio-range. See quadrant (v). v. One of the four areas between consecutive equisignal zones of a four-course radio-range station. Gartner Research "Magic Quadrant for SSL VPN, North America, 3Q06" by John Girard. We believe being placed by Gartner in the Challengers quadrant in the LAN switching market further validates our ability to execute and long-term viability. 1) Gartner Magic Quadrant for Information Access Technology 2006, Whit Andrews and Rita E.
We believe our position within the Magic Quadrant is excellent recognition because it confirms our capability of delivering security solutions that are in front of threats developing in the industry," said Mike Hall, Senforce president and CEO. The Gartner Magic Quadrant evaluates vendors and their products based on vision and the ability to execute that vision. 1 Gartner Research "Magic Quadrant for WAN Optimization Controllers, 2006," by Andy Rolfe and Joe Skorupa. Plateau Systems, a leading provider of software for developing, managing and optimizing organizational skills and talent, today announced that it has been positioned in the Leader Quadrant in the Gartner 2006 e-Learning Suites Magic Quadrant report (*). has published its 2006 Data Warehouse Database Management System (DBMS) Magic Quadrant which reports that the Teradata warehouse suite is positioned in the leaders quadrant based on the "ability to execute" and "completeness of vision" of its data warehouse implementations (Magic Quadrant for Data Warehouse Database Management Systems, 2006 - Donald Feinberg and Mark Beyer). Quadrant Engineering Plastic Products, Inc.
Quadrant Risk Management International Ltd.